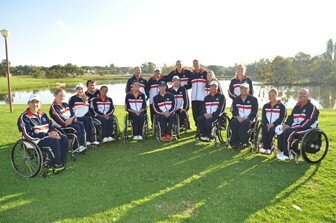 The 2011 World Team Cup matches the best wheelchair players in the world for the first time ever under the South African sun from Monday, April 25 to Sunday, May 1. In preparation for the event, USTA.com previews each of our American teams - Men's, Women's, Quad & Juniors - heading to the city of Tshwane and the University of Pretoria Sports Grounds and what to expect from the United States in competition this year. Jon Rydberg - Oakdale, Minn.
Stephen Welch - Southlake, Tex. Paul Moran - Northfield, Ill. Easily the most veteran team of the four en route to the southern hemisphere, this is a Men's squad out for pride, redemption and - most of all - a ticket back to World Group I, where it hasn't been in two years. "This is always a fun event, to play a team-focused style, but it seemed we were going to the same handful of sites over the years and when it’s the same hotels and the same courts over and over again it can get monotonous," said Rydberg. "I'm looking forward to going over there and having a fresh experience." To get back into the upper echelon, Rydberg knows that a fierce battle with a dominant Japanese team is likely to decide the U.S.'s fate. "The thing about (Japan) as the team to beat is that the not only have the top player, Shingo Kunieda, but they always seem to have up-and-coming players that could serve as No. 1s for many countries," said Rydberg. Kaitlyn Verfuerth - Tucson, Ariz.
Dana Mathewson - Tucson, Ariz.
Emmy Kaiser - Ft. Mitchell, Ky.
A team stacked with youth - their oldest player, Verfuerth, is 25 - this U.S. group is out to take its first World Team Cup since 1994. To have any chance versus the heavily-favored Netherlands - not to mention the rest of a very competitive international field - the American women will have to play at the apex of their ability. What's going for them? All have prior WTC experience and camaraderie formed in the desert, as Verfuerth and Mathewson played together at the University of Arizona. "With Dana and Emmy, I'm excited to be back practicing on the court everyday and playing for my country alongside them," said Verfuerth. "Dana and I know each other extremely well, and with Emmy, I hope we get to play doubles because I think we could really complement each other's play and win some matches." Verfuerth recently took a two-year sabbatical from the game after the 2008 Paralympics in Beijing to finish her studies. "I've really missed this event, so this WTC in South Africa is going to be very special to me," said Verfuerth. "Since coming back, I've never been more pumped to play tennis." Now the elder statesperson of the team - "I've always been the youngest - to be a veteran presence is all new, but I'm very much looking forward to it" - Verfuerth admits that taking down the Dutch would be a cerebral victory as much as a physical one. "I'm finding success in changing my mental game. Now, I know that when I focus on hitting the ball and hitting targets, good results will almost certainly follow," said Verfuerth. "We have to believe in ourselves and our own game." David Wagner - Chula Vista, Calif.
Nick Taylor - Wichita, Kan.
Bryan Barten - Tucson, Ariz. The defending champions return their entire championship-winning group from 2010, featuring two players ranked Top 5 in the ITF - 2011 Australian Open Quad singles champion and current world No. 1 in Wagner and a former world No. 1 in Taylor. Rounding out the trio is Barten, ranked No. 11 by the ITF in singles and No. 8 in doubles. A win in 2011 would make five titles in the last seven years since 2005, finishing no lower than second place in all seven tournaments. Even with a strong team, however, Wagner knows that powerhouse competition waits in the Rainbow Republic. "Physically, you've got some teams that can be overpowering. England is always up there, along with Israel. Canada, Holland and even South Africa, the host nation, we're expecting their best shot. "Its always a special privilege to be here, representing our country and governing bodies. We've got an awesome team and we're ready. I feel like a fire is lit under us right now. We want to get revenge on some of these teams that we've been losing to over the past few months and get things back to where we know we belong - on top." Taylor, who has played in WTC competition each year since 2000, celebrates that playing in South Africa crosses off another continent from his bucket list and presents a new slew of challenges for the team. "Playing at an elevation of 5,000 feet, is tough to prepare for and will certainly test all the teams in the draw," said Taylor. "That said, our depth is certainly high. Most countries only offer one solid punch while we can put out top players in every match, singles or doubles." Kate Stuteville - Colleyville, Tex. If the 2011 U.S. Junior team is to take home a title for the first time since 2000 - also the first year in which the junior competition was featured at a WTC - great contributions must come from one veteran and two first-timers to the event: Stuteville and Baron. Ryan Nelson, currently No. 19 in the ITF world boys' singles ranks, returns once more for the United States after a trying 2010 WTC in Turkey where he went winless in solo competition. Stuteville, ranked No. 9 by the ITF in girls' singles, impressed many in 2010 by advancing to the semifinals of the NEC Wheelchair Tennis Tour event in Dallas. Yet it is the contributions of Baron, the top-ranked American junior (No. 4, ITF girls' singles) of the three that could really give the group a shot in the arm. The 17-year-old is still fairly new to tennis, but has taken to international competition with strong showings in Baton Rouge and Thailand a month ago. "Up until very recently, I didn't know how I compared to other wheelchair players," said Baron. "Before last year, I had never been out of the country and now, to be playing in tournaments in Taipei, Thailand and now South Africa, it is such a great opportunity." The three junior players are rising products of the annual USTA/ITF Junior Camp Americas in Mission Viejo, Calif., receiving training from the top wheelchair coaches and players in the United States. "Back in February, one of the coaches called me up to tell me they wanted me for (the WTC) and I couldn't believe it," said Baron. "It really just hit me recently, when the uniform came in the mail that I get to go play against some of the best players in the world and represent my country. I can't wait."